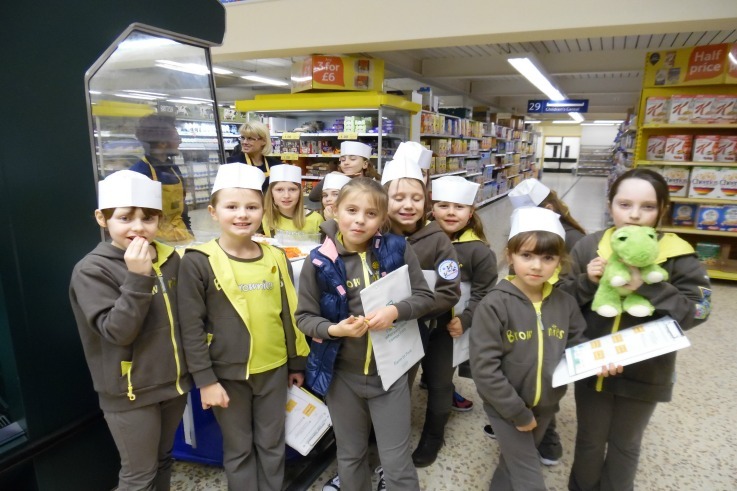 1st Wellington Brownies have become the first Brownie unit in Shropshire to be awarded the Girl Guiding UKs ‘Doing Our Best Quality Mark’ awarded by Ambition UK a nationally recognised accreditation. This is awarded to recognise the unit and its leaders on providing their Brownies with a safe environment, where the girls are able to take on new challenges, make brilliant friends and discover the world around them thought high quality experiences. Which makes a positive difference to their lives and their communities through a structured programme of activities. Unit leader and Brown Owl Joanne Martin said ‘I am very proud to be awarded the quality mark. I have been a leader for over 15 years and I was myself a brownie at this unit. 1st Wellington Brownies was first formed in 1961 and although things have changes the ethos of Girl Guiding UK hasn’t. The Unit has seen 100’s of young girls gain such a lot of experience and grow through the programme and experiences brownies is able to offer. It is such a rewarding position and privilege as brown owl to be part of their journey. As part of the portfolio of evidence we had to submit for the award, we carried out a brownie survey to find out what the girls thought the best thing about being a Brownies was and this is what they said ‘We love learning new skills, trying new craft activities, cooking, playing games, going on trips and most of all making new friends’, but we are always sad when the sessions ends and cannot wait until the next week’. In today’s fast-paced technological world, it is great for the girls to be able to ‘get back to basics’ and learn skills that will hopefully set them up for life. The programme of activities we put together, with the input from the girls is one, which enables the girls to build valuable life skills, self-esteem and confidence through fun and friendship both within the unit and at lager events. It is important for the girls to be involved in the programme planning, as it makes them feels part of the ‘Team’, practices their discussion skills and they enjoy the activities more. At 1st Wellington we offer the girls wide-ranging programme of activities which have recently included; a visit to the Jackfield Tile museum where we learnt how tiles were made, the history of Jackfield and ended the day with making our own tile. We have visitors to the sessions, which has included a model plane pilot to teach us how planes fly and how they are controlled. The girls have earned their First Aid badge learning the important lifesaving skills, which hopefully if they ever needed to use they will feel confident enough to. We recently visited Wellington Fire Station where the girls learnt about the work firefighters do, how to stay safe, the equipment the fire engines carry and they got to spray the fire hoses! 1st Wellington Brownies meeting on Wednesday evenings (term time) in Wellington. For more information or to arrange a free taster session for your daughter please visit www.girlguiding.org.uk/information-for-parents/register-your-daughter and search for 1st Wellington. If you are over 18 and would like to volunteer as a unit helper within Girl Guiding UK please visit www.girlguiding.org.uk/get-involved/become-a-volunteer for more information please note a DBS check will be required.